If you haven’t already, you can subscribe to these listings and get them delivered to your inbox at 7am every morning. Here’s how. And if you like what you see, please spread the good word. PANCAKES: Watch a pancake race or just remember to eat some - it's Shrove Tuesday aka Pancake Day. ART: The new, free Looking at the View exhibition opens at Tate Britain today, considering 100 years of the art of the landscape. Free, just turn up, open 10am-6pm. LUNCHTIME LECTURE: Find out how the Royal College of Surgeons has its origins with the Company of Barber-Surgeons, formed in 1540 with a talk called From Barbers to Surgeons at the Hunterian Museum. Admission £4, starts 1pm. TIME: The Petrie Museum invites you to take a tour with its timekeeper, talking about apocalypse movies, the novel Tristram Shandy and why Botox makes time go faster. Free, but book your place, from 6-8pm. COMEDY: Time Out present a cavalcade of sketch groups and comedians at the Pleasance for Joy of Sketch. See The Pyjama Men, the brilliant Jigsaw, Cardinal Burns, Sheeps, The Pin, Holly Burn, Thomas Nelstrop and Eleanor Thom. Tickets £12, book, starts 7.30pm. CARNIVAL: Micareta da Bahia is the closing party for this year’s Carnival celebrations at Guanabara. It’s a night dedicated to the state of Bahia, with live music, Djs and an Axe dance class. Free entry, open 5pm-2.30am. SAMBA: London School of Samba band and dancers make another appearance, this time at the Floripa Carnival Party in Old Street. Free entry, but book a table if you want to eat, doors 5pm-1am. OPERA: Fulham Opera perform Siegfried, part of the Wagner's Ring Cycle, at St John's Church SW6. Tickets £20/£15 concessions, prebook (also on Friday 15 February and Sunday 17 February), show starts 6pm. PIANO: Young German pianist Alice Sara Ott gives a recital at the Royal Festival Hall, playing Schumann, Schubert and Mussorgsky's Pictures at an Exhibition. Tickets from £10-£40, book, starts 7.30pm. DER SHVITZ: The Yiddish Twist Orchestra revive this deliriously danceable music from the 50s and 60s with a gig at Rich Mix alongside DJ Scratchy. Expect "a hallucinating mix of surf rock guitar, West Indian calypso, mambo, skiffle and Jewish folk melodies". Tickets £10 adv, £13 on the door, starts 7.30pm. STORYTELLING: The Crick Crack Club presents "Aerial artiste of the spoken word, Xanthe Gresham" performing Persian tales from The Shahnameh, accompanied by live Iranian music, Upstairs at Soho Theatre. Tickets £9/£7 concessions, prebook, starts 8pm. Perhaps the grandest pancake tossed in London is at Westminster School. 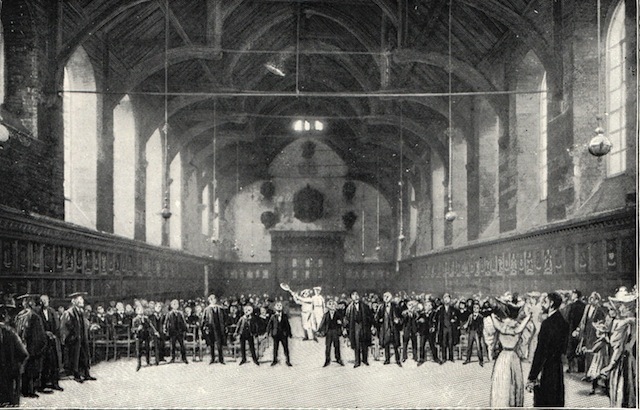 Every year, since time immemorial, pupils gather in an attempt to catch a pancake thrown in the school's main hall. The school chef prepares a particularly large pancake in a pan then tosses it over a pole, which divides the hall, 15ft above the ground. Pupils then scramble to get the largest piece of pancake. It's said that, way back when, deaths were caused by the frantic scrabble of boys. Certainly, health and safety concerns have now limited those who take part. The event is known as "the Greaze" and there's some really terrible YouTube footage of it taking place in 2009. Image: circa 1903 via Discovering London. Today's Better Bankside charity pancake day race is in aid of the charity, Paintings in Hospitals, which was established in London in 1959 by by Sheridan Russell, Almoner at the National Hospital for Neurology and Neurosurgery. He'd been displaying paintings by contemporary artists in corridors, wards and waiting rooms and saw the beneficial effect they had on patients. Today the charity takes care of an art collection of some 4,000 works which it loans to hospitals and healthcare centres across London and the UK for the benefit of service users, patients and the people caring for them. It also runs artist in residence projects enabling those undergoing treatment to get involved in creative activities. You can support Paintings in Hospitals by making a donation, buying limited edition prints from the shop, becoming a friend or volunteering your time. It wasn't supposed to snow all day yesterday, but it did. BBC Weather's forecast for today suggests a similarly drear 2, 3 or 4 degrees temperature which seems about right for this sleety snow to continue, off and on. Please put some leftovers, bits of bread, nuts and seeds to feed the birds in your patch if you can.